HAPPY DONABE LIFE - Mrs. Donabe's Rustic Japanese Kitchen: DONABE - #1 Best Seller on Amazon Japan! My sister sent me a text from Japan and said, "Your cookbook is #1 Best Seller in Japan right now!". 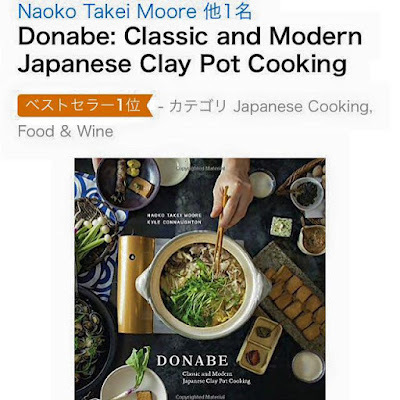 My DONABE Cookbook is ranked #1 in the Japanese cookbook category on Amazon Japan (as of January 3, 2016)!! Wow, what a happy surprise in the new year! I'm so happy that my book is well-received in Japan, too. I hope there will be an opportunity for the Japanese language version of the book published in the near future. My autographed copy of DONABE - Classic and Modern Japanese Clay Pot Cooking is available on toiro kitchen's website. So, hope you will check out if you haven't had a copy yet.